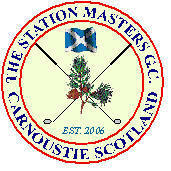 The Station Masters is the first Golf Club to be established in Carnoustie in the past 100 years. Fully affiliated to Scottish Golf and Angus County Golf Association, The Station Masters Golf Club, having just completed our 13th playing season, boasts a substantial membership in various categories including Full Playing (ladies and gents), Senior, Junior, Student, Country and Overseas. The Club operates out of the Station Hotel in the town and has adopted the Buddon Links as its ‘home’ course. The Station Masters has established a full competition playing programme including weekly sweepies over all three courses and monthly medals from April until October. Club Championships are hotly contested throughout the year with the Arthur Christieson Trophy going to the winner of the scratch competition. The winner of the handicap competition is awarded the Dave McNicoll Cup and the Dunbar Trophy goes to the foursomes winners with the Enfield Trophy awarded to the winners of the fourball competition. The Greensomes tournament entrants compete for the George Anderson Cup and The Country Cup is contested by members over the age of 55. We take part in established inter-club matches anually against the Mercantile GC, Carnoustie and Letham Grange GC, Arbroath.